With critical elections in November for leaders in California who will affect children’s education, Latino parents need to know that their voice matters and that they can make a difference — even if they can’t vote. That was the message from school and community organizers at a weekend workshop for dozens of Latino parents from South Los Angeles who have stepped up to become “parent ambassadors” for their children’s education. They heard that their immigration status or the language they speak at home should not be barriers to participating in the Nov. 6 elections. “There are three key positions that you should know will be up for election, and they will make major decisions affecting your child’s education,” Genesie Muñoz, a community representative for UnidosUS, a Latino advocacy group, said in Spanish at Saturday’s “Parent Ambassadors Induction” workshop organized by Synergy Academies charter schools. Muñoz said the election of a new California governor matters to Latino parents because “he decides on the budget, the money that goes to our schools.” The state superintendent “decides on the instruction, what our kids learn in the classroom, and other major decisions for all public schools in the state.” Along with the lieutenant governor, “These three people who are elected will make decisions that will impact your kids’ education for the next four years or even longer, so you better vote for the ones you think best represent your interests,” she said. Muñoz encouraged parents to exercise their influence on elections even if they cannot vote because of their undocumented status. Parents can also influence their high school children to vote, she said. The political involvement preparation is part of UnidosUS’s Padres Comprometidos program, which aims to empower Latino parents to play a leading role in their child’s educational success. During the workshop, parents also learned how to reach local elected officials, including their school board members, and how to exercise their school choice rights as charter school parents. On Tuesday, LA Unified launched a month-long campaign as part a resolution that declared Sept. 25 as “LA Unified High School Voter Registration Day,” aligned with National Voter Registration Day. Exciting news: more than 200,000 16- and 17-year-olds have pre-registered to vote in California since the launch of our program. Equally powerful: more than 100,000 have turned 18 and are eligible to vote this November! The resolution by LA Unified board Vice President Nick Melvoin was unanimously approved last month by the school board to register and pre-register students to vote, in collaboration with the City of Los Angeles Mayor’s Office and the City Clerk’s Office. The City Clerk’s office started to deliver voter registration forms to all the district’s high schools on Tuesday and they will be collected beginning Oct. 19. 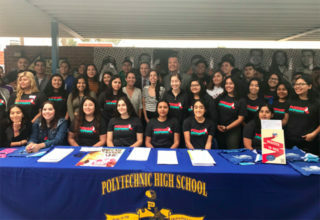 A spokesperson for the Office of the City Clerk said on Wednesday that approximately 25,000 voter registration forms were distributed to LAUSD high school campuses. The official number of students who have registered is not yet available. “I am proud to see the record numbers of California students registering to vote and getting involved in the civic process however they can,” Melvoin said in a statement. “Our youth are the leaders of today, and they will make their voices heard at the ballot box this November,” Monica García, school board president and co-sponsor of the resolution, said in the statement. The citywide campaign is a result of Mayor Eric Garcetti’s commitment in July to student members of the March for Our Lives national movement to having voter registrations at every high school campus in Los Angeles, the mayor’s press secretary, Andrea García, said Wednesday. The campaign allowed students to coordinate the events themselves at every school campus. “That resolution was important because it empowered students to do it (registration) themselves for their own peers,” she said. On Wednesday, March For Our Lives announced it will continue their national tour to 20 states and to engage young people to register to vote and to vote in November. The students are launching a final series of nationwide events under the campaign name #TurnoutTuesday. Oct. 22 is the deadline to register to vote. You can register to vote online at vote.gov. By law, you can take time off work to vote in person at the polls. If you have a child who is 16 years old, he or she is eligible to pre-register to vote. To be able to vote, you need to be a U.S. citizen, at least 18 years old by Election Day, and able to meet any other requirements your state dictates. Convicted felons and non-citizens are ineligible. *The article has been updated to add the number of voter registrations that were delivered to LAUSD high school campuses. And to add a quote from Muñoz.